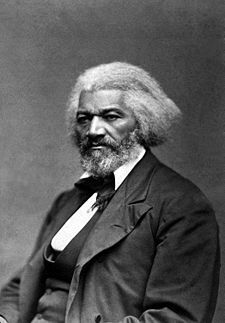 Frederick Douglass fought for slaves to be free. He was born as a slave in 1818 on a tobacco, corn, and wheat farm in Maryland. When he was born his name was Frederick Augustus Washington Bailey. He lived his first few years with his grandma. When he was six he was sent to his master’s house. This is when Frederick had to start working. When Frederick was ten he was sold to Sophia and Hugh Auld in Baltimore, Maryland. Sophia taught him to read and write. She had to stop teaching him when her husband got mad and told her it was against the law. Frederick kept learning how to read and write on his own. He was beaten when he got caught reading. One day he got tired of slavery and decided to escape. When he escaped he changed his name to Frederick Douglass. He did this so maybe he would not get caught and have to go back into slavery. Frederick believed that all people should be free. He became an abolitionist. These were people who wanted to end slavery. Frederick traveled giving speeches against slavery. He wrote three autobiographies for a newspaper article called the North Star. He worked with President Lincoln to write the Emancipation Proclamation. This document ended slavery. 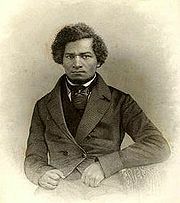 It was hard for Frederick Douglass to do the things he did. He had to escape from being a slave. It also was hard for him to learn to read and write because it was against the law. Furthermore, he would get hurt if he got caught trying to learn how to read. His life was hard because he was black. People did not want to listen to him because of the color of his skin.